Essence swatch - #43 Where is the party? | Memorable Days : Beauty Blog - Korean Beauty, European, American Product Reviews. 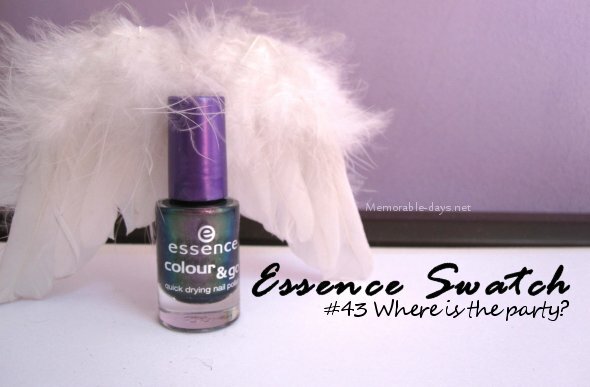 Essence swatch - #43 Where is the party? A few weeks ago I bought a bunch of new nail polishes, including this one. It's a nail polish from Essence which is called "Where is the party?". 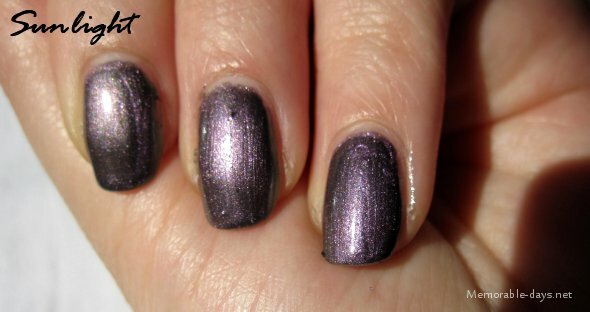 This is actually my first duochrome nail polish :D and I'm very excited to try it out! Check out the swatches below. The new versions of the color & go nail polishes cover your nails in the brightest colors of the spring season and really get you in the mood for a deluxe styling session! Ranging from pastel to bright to holographic – with these new colors, you’re sure to be super trendy! And thanks to the fast-drying formula and the flat brush, all it takes is one stroke of the brush per nail and your hands and feet are ready to hit the town! This nail polish costs €1,29 at a Dutch drugstore, Kruidvat. It's from the budget brand Essence. It's such a small bottle: 0.16 fl. oz/5ml. This is a swatch of the nail polish in sunlight. It's so cool that it looks so purple in the sun. Look at the next picture and you will see that it's green/purplish in the shadows. Quite cool huh? 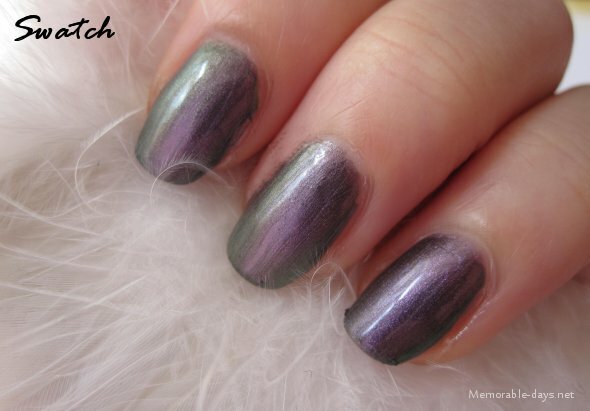 I think I will get addicted to duochrome nail polishes :D! HAHA Have you tried duochrome or holographic nail polishes before? Ik blijf hem mooi vinden! Ik heb zelf het lakje van Catrice die erop lijkt. Iron Mermaiden. Hm, dit is geen holografisch lakje? Dit is een duochroom lakje (een lakje waarin twee kleuren te zien zijn). Een holografisch lakje geeft zo'n vreemd regenboog effect van kleuren, zoals holographic van Gosh! :D Desondanks vind ik het wel een heel leuk lakje! Ik vind het wel een mooie kleur, maar ik koop hem zelf denk ik niet. Je hebt mooie nagels trouwens! @Man teng, yesss my bad.. had 't ff verbeterd hahah xD had in het begin wel staan dat het duochrome was, maar later begon ik opeens over holographic.. so my bad, thanks!! Ah ik weet niet wat ik ervan moet vinden. Opzich best leuk, maar tegelijkertijd trekt het me niet. 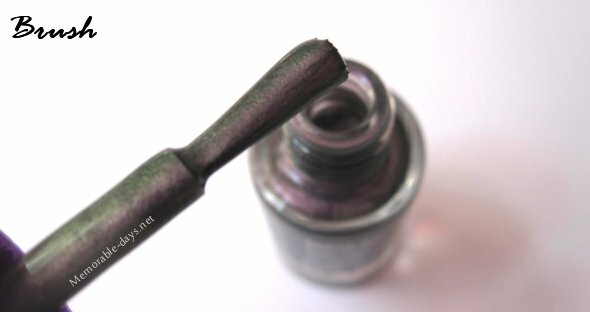 Ik heb 1 duochrome lakje: D26 van Cosmetica Fanatica. Een olie-achtig kleurtje. oe, hij is leuk! Die kleur heb ik ook haha ^^. Oooooooh... it's like magic lol! I'm more of a creme girl, I don't usually like even shimmer in my polishes so duochrome is probably a bit too much for me!